Weld On Sprockets are a line of sprockets that allow you to build your own sprocket. Our line X series weld on sprockets will accept any x series weld on hub. 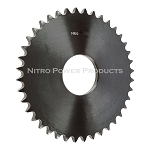 Hubs for our weld on sprockets are available in splined, hex, square or finished bores.